His first tryst with Carnatic music was at the tender age of three. 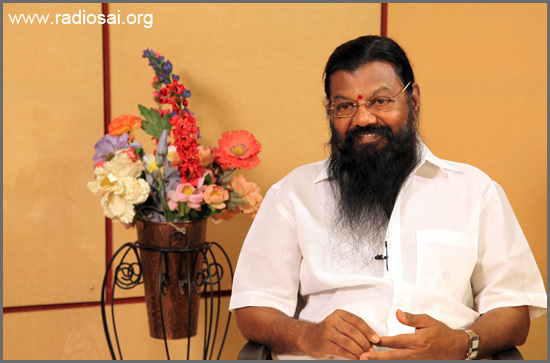 For Guruji Kaaraikkudi Mani, the meeting transformed into a love-affair of a lifetime. 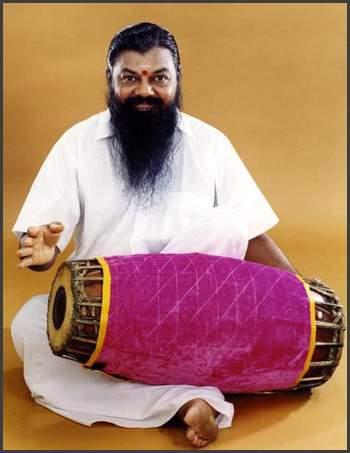 He started with vocal music but soon was drawn to percussion, and made mridangam virtually the breath of his life. Today the world hails this titan of rhythm as ‘Master Mani’ since perhaps no one in the contemporary times understands the power, beauty, aesthetics and the magic of mridangam as well as he does. Carnatic music percussionists the world over yearn to learn the Kaarikkudi Mani Bhani, the new style of music which has originated from this mridangam maestro. Needless to say, this exceptional ability to create, perform as well as train and teach music to thousands of students makes Kaaraikkudi Mani a Guru par excellence. But what endears him to all is his love – his love for music and his love for God, as also a love for Indian culture and its values. His simplicity and humility, integrity and purity coupled with his sage-like countenance makes him almost a Saint of a Musician. Guruji Kaaraikkudi Mani was in Prasanthi Nilayam in November 2011 to perform on the occasion of Bhagawan's 86th Birthday celebrations. We at Radio Sai spoke to him, just an hour after his magnificent performance in the Sai Kulwant Hall. 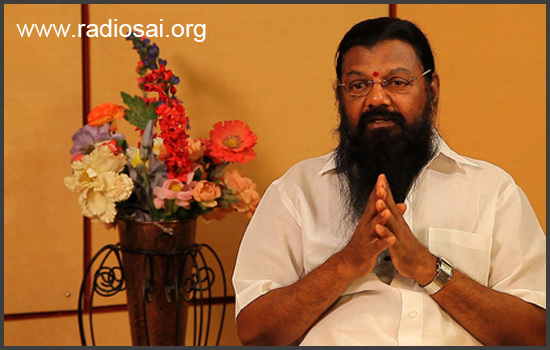 In conversation with Guru Kaaraikkudi Mani is Radio Sai's Bishu Prusty. Bishu Prusty (BP): Sairam Guruji and welcome to the studio of Radio Sai! It is a great honour to have you here – one who is so tremendously blessed and gifted by God. And when we see you and hear your music, it seems like you are God’s own messenger for music. And Puttaparthi is God's place! So tell us – how do you feel being in this place? Guru Kaaraikkudi Mani (GKM): Sai Ram! It is only because of Swami's will that I have come here. This is my first time. Even though I have endeavoured to come here many times earlier, I could not. It is said that if all our desires get fulfilled, then there is no job for God. But, to give what we wish for at the right time is God's task. We believe that Swami is God. He brought me here now as that is His will. So only when He wanted me to come here for His darshan, He brought me here. I have been longing for many years for this. I have seen His photos and videos and have been completely captivated. There is one important thing I'd like to mention. There are more than a thousand students of mine across the world. They continue to learn even now. There is a centre in London, another in Australia, and one in USA. There was one in Canada too. All these students and their families are Sai devotees. There are some who have apartments here in Puttaparthi also. Each time they invited me to come here, some hurdle or the other showed up. I even used to feel bad about this. Because I do not believe in being a mere musician. And there is a reason for that. Art is not something that everybody is blessed with. Just the name ‘Kaaraikkudi Mani’ does not command respect. The respect is for the art within me. It is the art that earns each musician the respect. Hence, one has to do something in return for this gift. One has to pursue art like Yoga. One has to continuously practise it like dhyana (meditation). That is how one can offer gratitude to the form of art. That is how I perceive my art. Nothing happens by merely wishing. Hence, it is He who has brought me here. If I've come here after so many years, it is entirely and purely due to His blessings. BP: You've performed in so many places all over the world. And now, you have done so in Prasanthi Nilayam. How is this experience? GKM: Generally once we finish playing and get off the stage, we forget about it. But to perform in Prasanthi Nilayam that too right in front of Swami's Mahasamadhi, is a blessing. It is indescribable, something I hadn’t even dreamt of! When I sat on the stage, I could not believe myself. It was exhilarating! That too, it is the first year of Him moving from His Sthoola Shareera to the Sookshma Shareera, from the physical form to the subtle aspect. I played only for Him. I wanted to make Him happy. I felt that even if He feels a little bit happy, it would confer shreyas (good merits) on me. I felt moved! BP: And you chose to play for a bhajan which many devotees could relate to. And in the end too, you had Raghupathi Raghava... Did you plan for this? Or it just happened? GKM: Yes. When my students give their debut concerts in foreign countries, one or two Sai bhajans are certainly included, because they are also Sai devotees. In London, when one of my students named Arjuna Jaishankar gave his debut concert, we selected this song. I have listened to a lot of Sai bhajans but this one is my personal favourite. I have seen 20-25 videos of Baba giving discourses too. BP: And what is it that you really like about Swami and His teachings? GKM: I am associated with a Kundalini Yogi and Hanuman Upasaka (worshipper) by name Guru Surajananda. I spent more than 18 years with him. It's over 19 years now since he attained Samadhi. In concert in Prasanthi. Guruji says, "If we have complete faith in Baba and are devoted to Him and follow His teachings, the vibrations will definitely reach Him"
During the years I lived with him, he mentioned the very same things that Bhagawan has spoken about. What we can understand from this is that pure souls — yogis, sanyasis, or Swamijis — all speak about the same principles. For instance, take Ramakrishna Paramahamsa. He lived for some time as a Muslim, some years as a Christian, and then as a Hindu. Everybody preaches only ekatwam (Oneness) — God is nothing but Akhanda Paripoorana Ananda Satchidananda Jyoti Swaroopam (the Embodiment of Eternal Bliss and Light) and Ramakrishna realized that. All saints and masters advocate the same thing. Since I moved with Guru Surajananda, I could understand the oneness in his and Bhagawan's teachings. The service projects of Bhagawan are truly worthy of appreciation. This is something that nobody can do; not even governments. Generally, people are associated with a Guru for some reason, like for progress in their career, family welfare, or business growth. But I've observed that people who come to Bhagawan are selfless; they work selflessly. These are the things that have really attracted me to Bhagawan. In following a Guru, one must take efforts to observe His actions and message, and practise them. Otherwise, there is just no point in going to the Guru. If people are disciplined when in Prasanthi Nilayam and get back to their old ways once back home, there is no use of having a Guru. Only if we follow His teachings in all places, He will bless us. About 40 years ago, when Puttaparthi was not this well-developed, I got a chance to meet Baba on a flight. Those days, He did not travel by a separate plane. He used to fly first class, along with everybody else. That day I happened to be on the same flight and I was blessed with His padanamaskar (touch of His feet). This is evergreen in my memory! BP: What a heavenly blessing! Did you ever discuss about Swami with your Guru? GKM: Yes, we have discussed quite a lot. Bhagawan has never used anything for Himself. He has given everything away for the people of this world. My Guru used to say with amazement that nobody can ever match what Bhagawan has done. BP: Baba says that music is the shortest way to connect with the divine. We have seen that ourselves because it is so easy to please Swami and get His blessings when you perform nicely – be it singing a bhajan or playing on an instrument. Swami has always taught us that music is divine. And the best music emanates when one connects with the Source. So, are there times when you feel very connected with the Source and times when you don’t? Or do you always feel connected to that Source? GKM: Music is considered the easiest way to achieve God. This path is referred to as Nadopasana - worship through music. You see, there are deities for all the seven musical notes. Every note has a Beejaakshara Mantra too. So when the musician starts focussing and practising as per the norms, that is, keeping in mind the shruti shuddham and laya shuddham (in strict compliance of tune and rhythm) one can attain a state of dhyana, it is a kind of meditation. What is meditation? It is the art of focussing the mind. Similarly when music is focussed and channelized, it is not an entertainment or an engagement in fun, it is an elevated state. This is my belief. There is a saying in Tamil, “The head is the most important part of the body.” If one loses a hand, one can live; if one loses a leg, one can still live. But if the head is lost, one cannot survive. The other forms of music that are performed, be it rock, pop or jazz, make one shake the body and tap the feet. But classical music makes people nod their heads in appreciation. Music takes the Atma (soul) to a higher plane. You have to inhale music and then bring forth your experience as music again. Then the fragrance spreads. When you do so, the person seated in the audience need not even know music. This is because you are dealing with Truth. When you play good music, it has a positive impact on your physical well being too. I have experienced this. You see, they do not know much about Indian classical music or its rhythms. But, wherever there is Truth, it will be recognized. I have experienced this state of meditation many times during my concerts. I can feel the energy within my body as I play. This means there is Truth within and I'm in touch with that Truth at that moment. I feel it. BP: For a musician, purity is so important. GKM: Definitely! Unfortunately, gimmicks and mimicry have become popular now. I feel very sad about it. It's so unfortunate. There is a difference between musicians commanding respect and on the other hand, becoming popular. When musicians gain respect, people will talk about them even after their death, even after several hundred years. But popularity will remain only during the person's lifetime; it is like passing clouds. BP: The ancient Gurukula system of imparting music also instilled discipline and purity in the students. GKM: That's true. Nowadays, it has all become so mechanical. Students who go to a college have just one period of 45 minutes for music. How can you thrust in music in just 45 minutes? Musicians who have trained in the Gurukula system are spoken of even now. People who trained under gurus like Musiri, Semmangudi Srinivasa Iyer, and Palghat Mani Iyer have all made their mark. Not everybody can learn music. Any person can become a doctor or an engineer, with a certain bit of intelligence and wherewithal. But becoming a musician requires merit from previous births.